For Burger #2, I made my way to The Old Triangle. 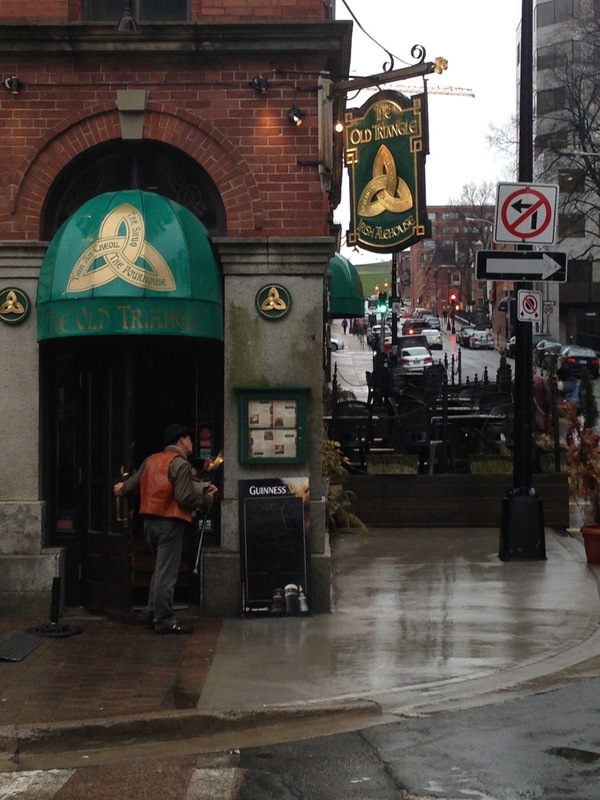 Found in downtown Halifax at 5136 Prince Street, The Old Triangle is a great place for either a cold beer or a tasty meal (or in my case, both). A large dining area and two separate bars allows for a large group of people to be accommodated at the same time. Living up to the ‘Irish Alehouse’ style, this place features a charming interior as well as some sort of live music each night. For this meal, I chose the only beef burger that they have on their menu, which is titled the Belfast Cheeseburger. Upon receiving the burger it was obvious that this was your traditional cheeseburger. Loaded with your classic lettuce, tomato, onions, and pickle, this burger appeared to be yet another take on a very standard burger. One thing that did catch my eye was how perfectly cooked the handmade patty appeared to be, which made me eager to take my first bite. After the first bite, it was clear that this wasn’t just a standard burger. In a case where you have your traditional toppings, it really comes down to the actual patty itself. This handmade 6oz burger was delicious. 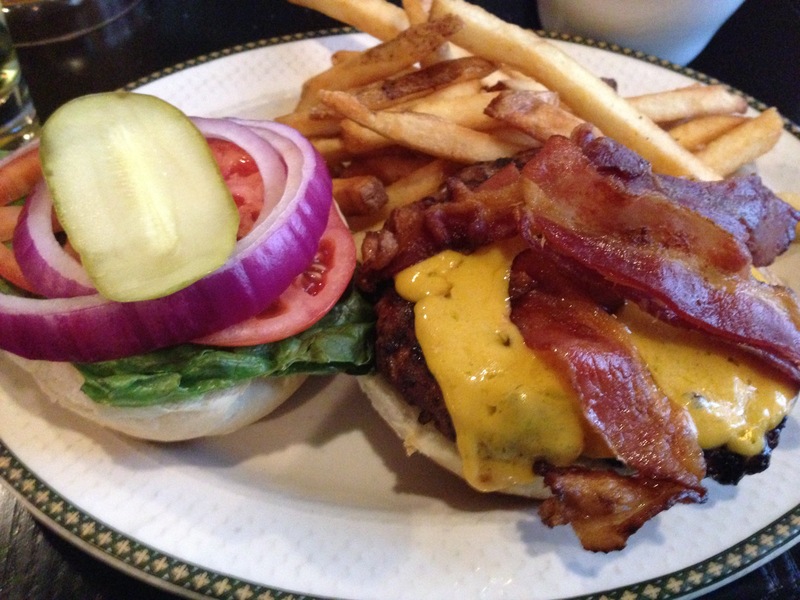 It was both seasoned and cooked perfectly, and added together with the bacon and cheese, this burger was a pleasant surprise. My one complaint, and this is strictly a personal issue, was the amount of onions that came on the burger. It was loaded with onions and I’ll admit, that being someone who is not a huge fan of them, I ended up taking off one of the rings. One thing worth mentioning aside from the burger, was the delicious gravy I got to accompany my fries. I would definitely recommend giving it a try! I’ve frequented The Old Triangle many times, usually later at night when the main focus was coming in for a few beer. We came here during dinner time on a Friday, and it was fairly busy. There definitely seemed to be a lot of people who had just gotten off work and were coming in for a cold one to cap off the work week. There was many people there for food as well though, and I found myself looking at what other people had ordered, and made a mental note of what to try next time (the stew in particular). Our waitress was very nice and our food came out very quickly. Another point to mention was that either the manager or owner was seen going around to the various tables making sure everything was sufficient for each customer, which really added to the quality of service. The cost of this burger was $13. 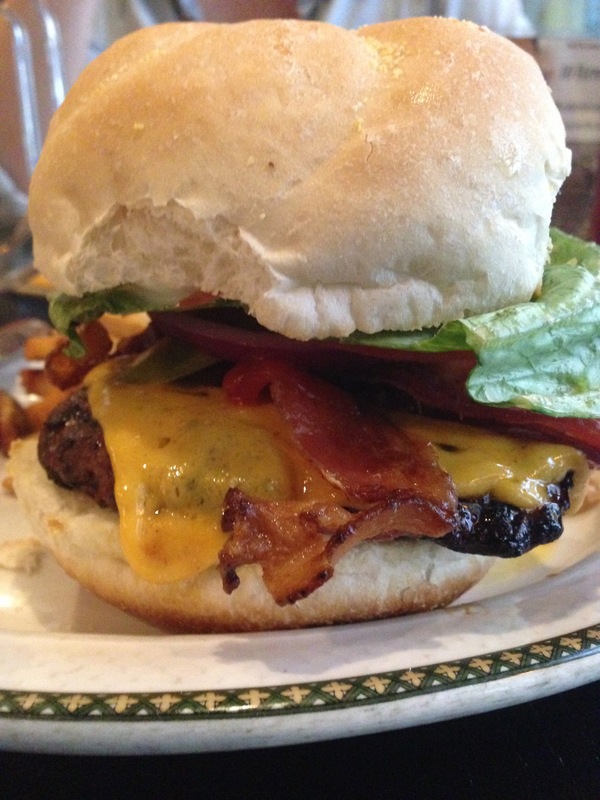 I did enjoy this burger and $13 tends to be in the area of what most burgers cost. However, given that this burger didn’t really have anything but your basic toppings, it is hard to look past the fact that this falls in the same price range as other burgers, which can sometimes feature more interesting toppings. That being said, I would probably pay this price again for this burger. This burger was definitely a good time. I would recommend it if you happen to be at The Old Triangle and are looking for a tasty and filling option. That being said, I probably would not go out of my way to come here just based on the burger, but the environment of The Old Triangle does make it appealing to come back and possibly try the other Irish inspired menu items.